Recently, I experienced a disappointment that cast me into a day or two of sadness and defeat. It required purposeful effort to bring my emotions under the control of the Spirit, realigning my thoughts with God’s truth. In other words, it took preaching the gospel to myself again and again until my heart was settled and I could discern the way forward. Peter says we shouldn’t be surprised when trials and testing come and yet we are often not only surprised, but tempted to give our emotions more weight and authority than they rightly deserve. Whether testing comes through a spiritual attack of the enemy, as a result of our sin or the sin of others, or through the lies and temptations of the world, the way back to truth is always the same. The gospel provides a firm and unshakable foundation for us to stand upon with confidence when the ground gets shaken beneath us. The amazing truths of what Christ has done to rescue us from an eternity of lies and emotional instability will help us regain our equilibrium no matter what is going on around us. But in God’s abundant kindness, He also places believers in a local church where we can spur one another on to love and good works, while building one another up in Christ. Hebrews 10:19-25 reminds Christ’s followers that, because of the gospel, we can draw near to God in full assurance without any guilt or shame. No matter what life throws our way, we can confidently pour out our hearts to God and know that He will use all things (good and evil) to work together for our good and HIs glory. Therefore, brothers and sisters, since we have confidence to enter the holy places by the blood of Jesus, by the new and living way that He opened for us through the curtain, that is, through His flesh, and since we have a great priest over the house of God, let us draw near with a true heart in full assurance of faith, with our hearts sprinkled clean from an evil conscience and our bodies washed with pure water.Let us hold fast the confession of our hope without wavering, for He who promised is faithful. This passage goes on to remind us that one of God’s precious gifts to His children is the fellowship of believers, His church. As the Director of Women’s Ministries in my local church, one of the things God continues to teach me is the power and blessing of encouragement. Through the ministry of God’s Word and prayer, He uses redeemed people to encourage each one another in their daily walk. I have been blessed to observe the many creative ways women in the church use their gifts to bring God’s love and comfort to the weary or hopeless. God calls us to strengthen and encourage each other as we run our spiritual race. Recently I was the recipient of a basketful of encouragement put together by my daughter who knew I was in the midst of a difficult trial. 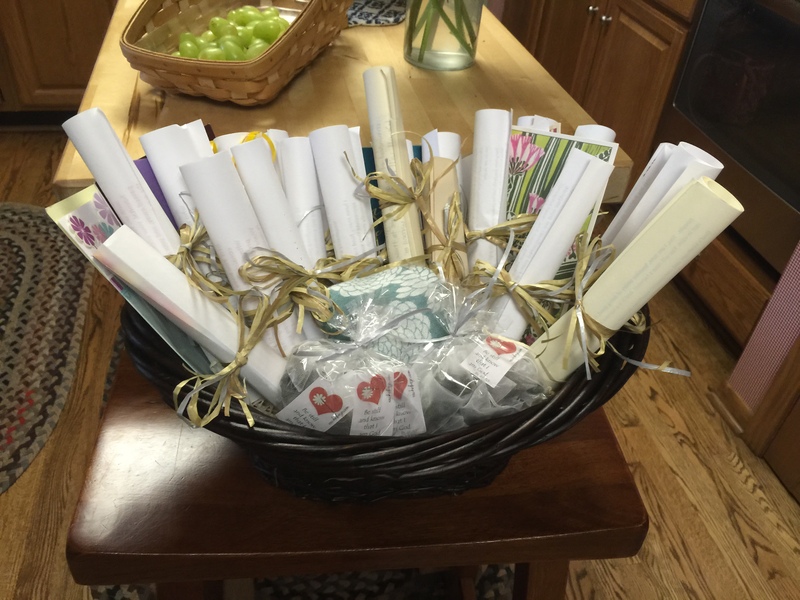 Without my knowledge, she filled a basket with little gifts and letters written by a number of godly women in my life (including her own). God overwhelmed me with His love through the kindness of friends who shared precious words of grace filled encouragements along with truth from God’s Word. And isn’t that what we need most when the darkness descends; words of grace and truth spoken by God through sisters (and brothers) in Christ? 1. To remind us of gospel truth in a world that’s intent on feeding our natural appetite for self-gratification and exaltation. We need frequent reminders of what we deserve as opposed to what we’ve been given as a result of God’s love and mercy. As recipients of God’s abundant grace we, of all people, should be eager to bend that grace towards others. Believers have the responsibility and privilege of reminding those who have strayed from gospel thinking that, because of Christ, we have power over sin and no longer have to walk as the world does. We need one another in this battle for our minds. 2. To comfort one another by our presence. Sometimes we simply need other people to be close by; to offer a comforting hug, an understanding smile, or drop a meal off when life has become overwhelming. The presence of godly friends assures us that God has not forgotten us when circumstances dictate otherwise. 3. To stand in the gap and pray for one another. Alfred, Lloyd Tennyson said; “More things are wrought by prayer than this world dreams of.” You and I are walking in, standing on, and surrounded by answers to prayers that have been prayed in the past by us and by others. But prayer is hard work! Waiting on God for His answers takes perseverance and faith. Trusting Him with the physical and spiritual protection of our children is a day to day walk of faith. And praising Him when we can make no sense of what He’s allowed in our lives reminds us that God is God and we are not. The prayer of a righteous person has great power as it is working (James 5:16). Prayer is a gift God gives so that we might participate in the work He is doing in our lives and the lives of others. 4. To spur one another on to good works. It’s easy to get caught up in the dailyness of life, isn’t it? We have good intentions to call a person who’s been on our mind, invite a sister for coffee who is feeling alone, or offer to watch a young mom’s children so she can have a break; but then we get busy and it never happens. Busyness can keep us from doing the good works God has prepared for us to do. Yet there is no sweeter blessing than following the prompting of the Spirit and knowing that God has used your small effort of faithful obedience to bless someone else for His glory. We also need to stir one another up to pursue holiness. Our flesh is strong and we can all find plenty of excuses to justify our selfish use of time and resources. Loving brothers and sisters remind one another that God has set us apart for gospel proclamation and living by the power of the Holy Spirit. 5. To remind us that time is short but eternity is forever. It is easy to get bogged down with the heaviness of life and constant demands on our time and energy. It’s helpful to be reminded that there is eternal purpose in our pain, meaning to the mundane, a future free of sin, and redemption of our suffering. When life begins to feel like one unending dark tunnel , it encourages us to remember that we’re on our way to glory! 6. The church provides godly examples, that we might learn from those who have gone before us. I have learned much from other believers who have served me and others through selfless, sacrificial acts of generosity and kindness. The fearless faith of those who have left home and family to go serve in foreign lands encourages me to live and serve more boldly in my own sphere of influence. Believers who have demonstrated confidence in God’s goodness and power in times of trouble has fueled my own desire to trust Him in dark times. It is sobering to remember that people are watching the example of our lives even as we are learning from theirs! 7. The church is God’s provision for training the next generation to love and fear His Name. Psalm 78 commands us to tell the coming generation the glorious works of the Lord, and His might, and the wonders He has done. This is the work of families but also the church. I thank God for godly men and women who have taken an interest in my children’s lives, prayed for them, and encouraged them to live for Christ. God calls us to invest in the next generation by living and speaking life giving truths that will point them to salvation in Jesus Christ. Bring your children into the worship service with you and introduce them to older saints. Help them get to know other adults who will be godly examples to them. In Paul’s letter to the Philippians, he points us to the Source of our encouragement and the encouragement we offer others. “So if there is any encouragement in Christ, any comfort from love, any participation in the Spirit, any affection and sympathy, complete my joy by being the same mind, having the same love, being in full accord and of one mind” Philippians 2:1-2.
Who has God placed on your heart to encourage this week? If no one comes to mind, ask Him to reveal someone who would be blessed by a note of appreciation, an invitation to spend a couple of hours together, a phone call, or having a tangible need met. We may never know how much it has meant when we’ve taken time out to listen to a lonely person, encouraged a young mom in the grocery store, or thanked someone for their quiet but faithful service. We may have no idea how much our small act of encouragement spurred them to persevere in faith, but we will experience the joy and satisfaction of obedience as we do the most important work God has called us to do. Dear friends; encourage one another, and all the more as you see the Day drawing near. What a beautiful post Linda. I have been laid low with autoimmune issues and unable to attend church for a couple months. It’s been the hardest thing. I miss the community and seeing other women from church. I totally understand how it is to let your mind wander from Spirit thinking. I sure can tell when I need to get myself pointed back toward God. The negative thinking, the panic of “will I ever get better”, “does anyone care”, “does God even see me anymore” etc…so destructive to peace. I catch myself in those moods sometimes and I have to steer myself back to Truth. Oh Catherine, my heart goes out to you as you struggle with this autoimmune issue. Even though I know you battle negative feelings, the Lord sees you and is fighting for you! I trust your LIFE group encourages you in the Lord but I pray that the Lord will sustain you and one day bring some measure of healing to you. Linda, I am only in contact with Pam Meyers, my dearest friend, who’s been very supportive! I am on weekend bed rest as I work full time in a very stressful job (very very hard to do) so I don’t really see anyone else right now. I have talked to Laura K several times and she’s been so good and faithful in praying with me. It’s just so hard when you just want your old life “back”……I was in two Life Groups and a greeter church, and loving my church life and then suddenly…it all ends. My faith is strong, and I trust our Lord fully, but sometimes…it’s just so hard. Thanks so much for your kind words LInda. Good to hear from you and I treasure all your posts! You are in a very hard place, Catherine. If you have never read Amy Carmichael’s book Rose from Briar, I think you would find it a great encouragement. Like you, Amy was taken out of a vibrant ministry after an accident that left her confined to bed and in constant pain for the last 16 years of her life. Her writing has encouraged many in their time of suffering. God bless you sister. God has used you tremendously in my life, and I am grateful. And grateful for your honesty and straight-forwardness in writing these blog entries. They are of immense help – for they always point to Jesus. We must constantly be telling ourselves the truth of the gospel – or else we will be falling apart. May the Lord continue to encourage you with His truth. May we all learn how to encourage one another with the words and actions He gives us. Thank you Susan. God has often used you as His instrument of encouragement and I appreciate you so very much. Thank you for your kind words and I pray that God continues to bless you in your new home.